The Lemonhead Movement was started by entrepreneurs and educators to empower and inspire the next generation of entrepreneur. Lemon Lessons is the foundation to any business or entrepreneurship program. Lemon Lessons is the only program that teaches the entrepreneurs mindset for classes of all ages. Students learn a new approach to experiencing problems in the world and turn them into profitable businesses or community organizations. The Lemon Lessons Curriculum is the complete program for after school, workshop, Middle School, High School, Higher Education, or Adult Education coursework as it incorporates academic and hands-on learning based on the book. Empowering the next generation entrepreneur. ​THE LEMONADE STAND CO-AUTHOR ARA BAGDASARIAN SPEAKS ON THE IMPORTANCE OF TEACHING THE ENTREPRENEUR’S MINDSET IN HIS TEDX TALK ENTITLED “HARNESSING INTELLECTUAL LIGHTNING TO POWER A BRIGHTER FUTURE”. Local Lemonhead Councils (LLC) are an advisory board of successful entrepreneurs who provide feedback and share their experiences with entrepreneurs. The goal is simply for entrepreneurs to help entrepreneurs succeed. At each LLC meeting, two companies or entrepreneurs make a 20 minute presentation that describes their business, opportunities, and challenges. The Council shares their insights in a 40 minute roundtable discussion with the entrepreneur. If you would like to start a Local Lemonhead Council in your community, Download the “Starting Your Own Local Lemonhead Council” kit now (PDF). THERE HAS NEVER BEEN A BETTER TIME TO BE AN ENTREPRENEUR.And there has never been a book that will better equip, empower and inspire anyone that wants to turn problems into profitable innovations. Each of the thirteen principles in The Lemonade Stand Book show you the path your idea can travel in order to become refreshing, sweet and profitable lemonade. 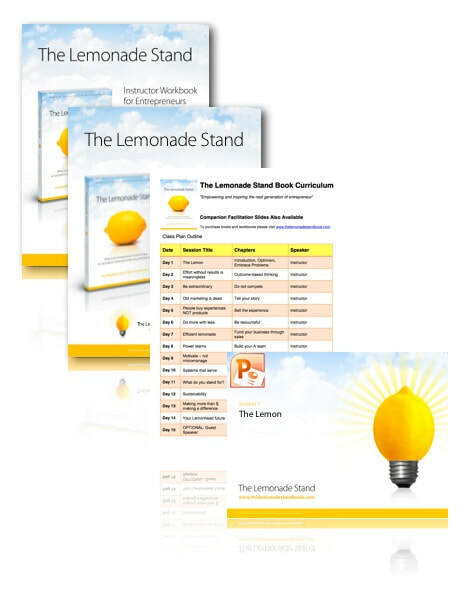 Buy the book now, learn the details of each principle for a successful Lemonade Stand Business and get started today! Ara H. Bagdasarian is CEO and Co-founder of Omnilert, the inventors of the campus emergency notification system which now connects over 20,000 organizations with 8 million subscribers. As a lifelong entrepreneur, Ara launched his first business Kidco at age 8. In 1996, Ara founded XNETIX and webRESONANCE in 1999. Both companies were early-­‐market providers of web-­‐based applications that powered hundreds of Internet startup companies. Recently, Ara has been in the national news media dealing with Omnilert and its brands: e2Campus, Amerilert, and RainedOut. He has appeared on TV, radio, and in newspaper interviews on CNN, ABC, CBS, USA TODAY, NPR, Wall Street Journal, Time Magazine, Washington Post, Harvard Review & others. Ara is an active community leader who served as Chairman of the Town of Leesburg’s Economic Development Commission, President of the Loudoun Symphony Orchestra, Vice-Chairman of the United Way National Capital Regional Council, Advisory Board member of VTV Outreach Foundation, and founding Board member of the Loudoun Center for the Arts. He also is an advisory board member at the George Mason University Enterprise Center in Leesburg, VA.
Ara is a graduate from the State University of New York College at Buffalo and recipient of the Young Alumnus Achievement Award. Nick Gustavsson is the Co-founder and Chief Technology Officer for Omnilert. The company launched the first campus emergency notification system in 2004 and is now relied on in over 800 college campuses in the United States. Nick has established a reputation of innovation in the wireless industry and serves as an adviser to a number of federal government and military agencies on wireless technology. Nick was a founding member of Baltimore Venture Mentors, advised the Mayor of Baltimore on technology issues, and serves as an advisor to the George Mason University Enterprise Center on mobile issues. As a graduate from Vanersborg College in Sweden, Nick also holds a commercial pilot’s license and was appointed by Kentucky Governor, Steve Beshear as a Kentucky Colonel. This step-by-step curriculum lays out each sessions activities including discussions, small groups activities, and presentations. The first set of instructor presentations that includes slide-by-slide notes including discussion questions. The modules cover each section of The Lemonade Stand book and fosters an interactive dialogue on each chapter. ​The second set of instructor presentations that includes slide-by-slide notes including discussion questions. The modules cover each section of The Lemonade Stand book and fosters an interactive dialogue on each chapter. ​The award-wining “why-to-book” on entrepreneurship which presents a unique approach to turning problems into solutions into profitable businesses. This is the book upon which the Lemon Lessons curriculum is based. The comprehensive companion to The Lemonade Stand book and integral component to the Lemon Lessons curriculum that offers thought provoking questions that challenge the student.